Valentine’s Day Skate- Bring A Date! Wednesday November 27th, 2013 6-10pm . Start a Family Tradition or get the kids out the house while Moms prepare for Thanksgiving. Fun for the whole family! 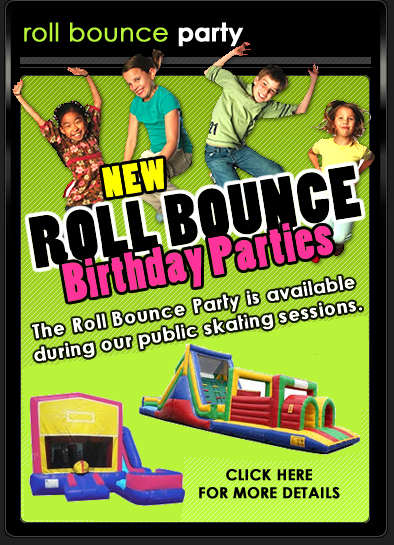 New Smoky Mountain Sk8way & Fun Zone Rack Cards! First Late Skate in the newly expanded rink. We’ve gone from a 10,000 sq ft building to 20,000 sq ft of pure entertainment! Come join us Saturday October 26th for a Halloween Late Skate and Monster Ball! COSTUME CONTEST Grand Prize winner receives a free pair of speed skates! KB Jams in da house!!!!! Roller Derby for everyone! 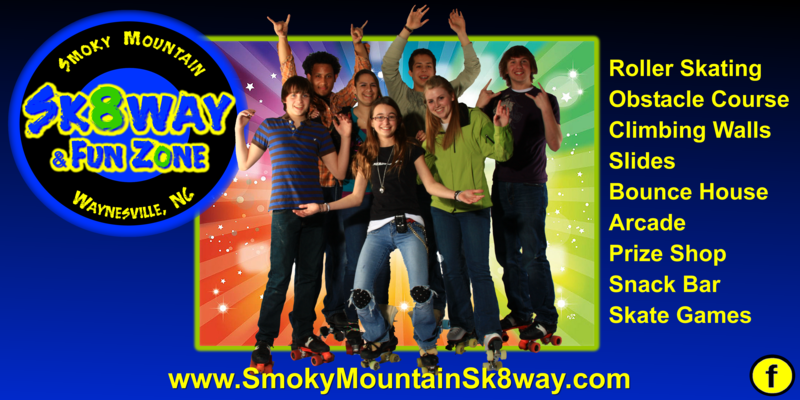 Smoky Mountain Sk8way sponsors 3 teams and is one of the most family friendly leagues in the nation. 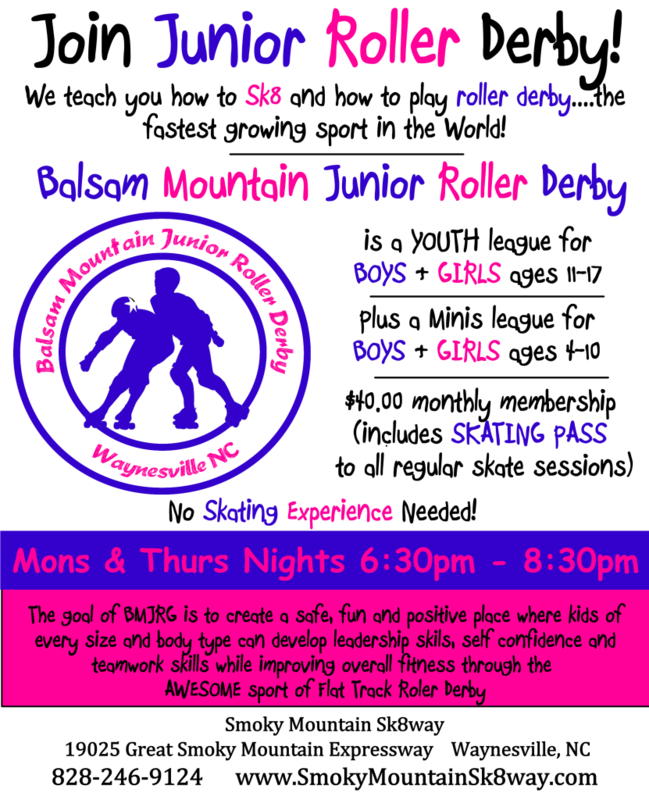 Balsam Area Derby Association consists of an Adult Women’s team, a junior team for boys and girls 11-17 years old and our new Mini’s team for kids 4-10 years old. Balsam Mountain Roller Girls, for women 18+, is an all inclusive league for people of all genders, sizes and skate levels. Even if you are male, can’t skate, don’t want to skate, or want to skate but do not want to compete, you can be a part of the team. We can teach you how to skate and we have many opportunities for refs and Non Skating Officials (male and female). We have a coed junior team, Balsam Mountain Junior Derby, for kids ages 11-17 and introducing our new Minis team for boys or girls ages 4-10 years old which are also all inclusive for skaters of all skate levels. 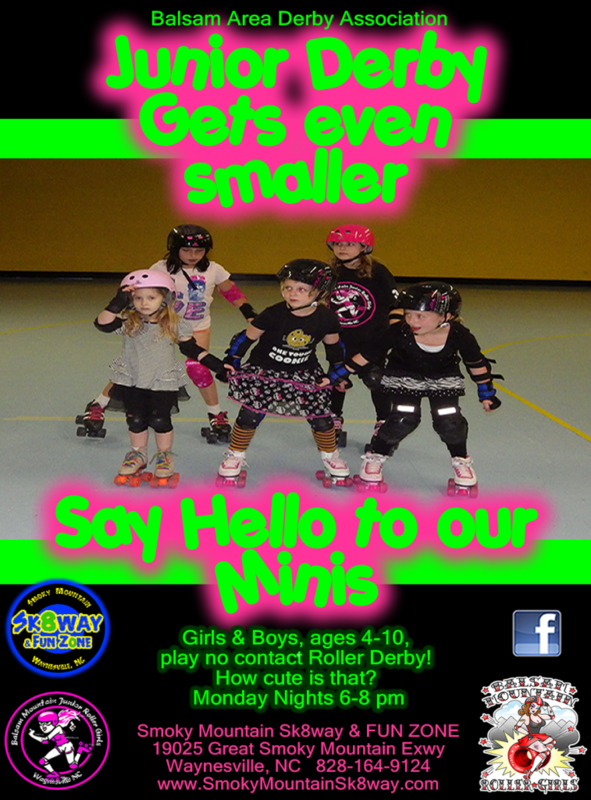 90% of our adult team members have kids on the Minis or Junior team and that is why we are one of the most family friendly sports and derby teams in the World. Where else can you play, practice and work out with your kids every week in a competitive sport. Roller Derby is the fastest growing sport in the World and for good reason. It’s FUN! Balsam Mountain Roller Girls, Haywood County’s First Women’s Flat track Derby League. Who can play – The Balsam Mountain Roller Girls is an inclusive roller derby team for any woman age 18+ with an interest and willingness to learn and participate in this sport. Derby Gear– Roller skates (quad style), derby helmet, derby style knee pads, elbow pads, wrist guards and a mouthguard. Join – New members are welcome on Sundays. First practice is free with a signed waiver and limited participation. Second practice you will need to bring copy of state id, pay dues ($40/month which includes monthly membership to all regular public skating session at SMS) and begin acquiring gear. You should try to have gear within about 2 weeks. 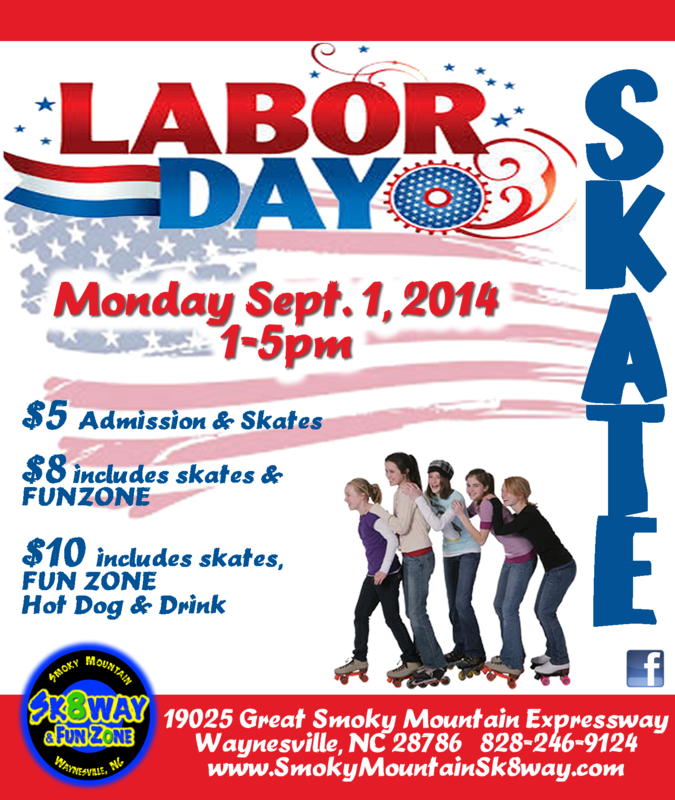 Practice – Practice is held on Mondays and Thursdays from 6:30-8:30 at Smoky Mountain Sk8way. Expectations- In order for every member of Balsam Mountain Roller Girls to perform at their best, it’s imperative that everyone make a strong effort to attend all required practices, bouts, community service events, and other team activities. However, with the understanding that each member has their own responsibilities, depending on that member’s role, not all events will be considered required. Prior skating experienced encouraged but not required. Season begins the first week of March! 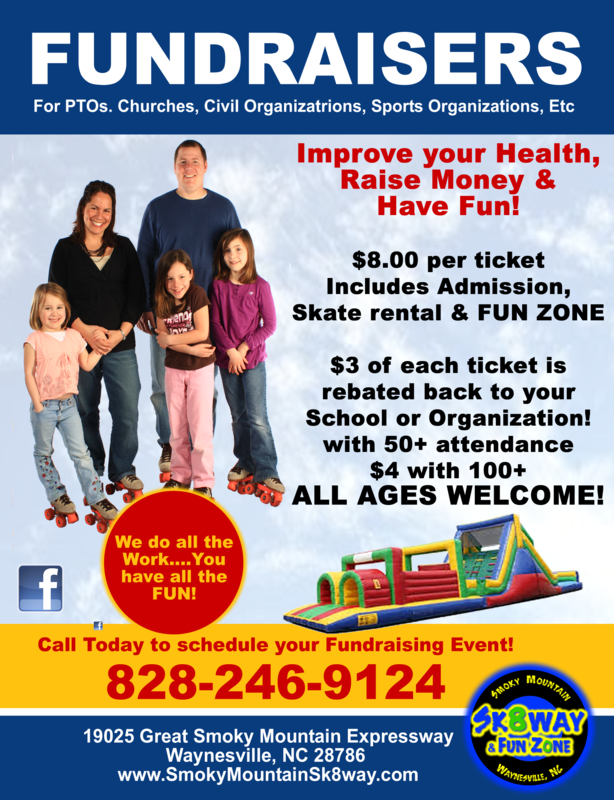 Description: $2.00 of every Skate for Schools admission will be donated to the Haywood County Teacher Foundation! Description: Come out and join us for a Sweetheart Skate on Valentines Day! Take your special someone out to dinner and then stop by for a couple of hours of skating. Special price of $10.00 and a free rose for the lady.